Golden Shine Quick Shine Premium Pack | Cal Car Cover Co.
Stock up and save with our Quick Shine Instant Detailer and Quick Shine Detailing Towels. Two of our best selling products; Quick Shine adds gloss and depth of shine while safely removing dust and dirt. Our Detailing Towels are ultra soft and gentle against your vehicle's paint. 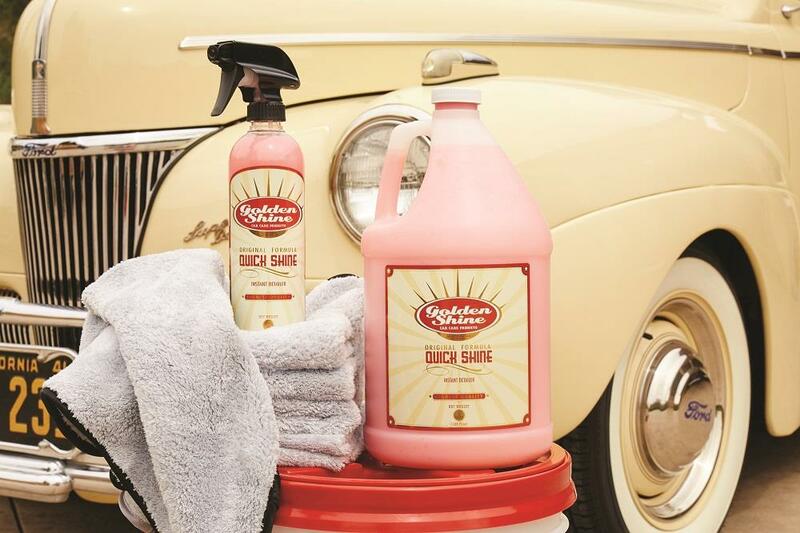 No garage or car care kit is complete without our Golden Shine Quick Shine Instant Detailer. It is an excellent product to maintain your vehicle in between car washes. We feel that it is the best car detail spray on the market and our customers agree. It is year after year the best selling product in our Golden Shine Car Care line. To use, simply spray it on your vehicle and gently wipe away the product with a Premium Microfiber Towel to add a show-stopping shine to your paint. It removes dust, smudges, fingerprints, bugs and bird droppings with ease and leaves a glossy finish. Flip or rotate towels as needed to ensure that a clean and soft towel is touching your vehicle. This will prevent streaking and give your vehicle the ultimate shine. Golden Shine Quick Shine is not intended to replace a traditional car wash, but should be used as a maintenance product in between washes. It is easy to use and a quick clean up of a vehicle only takes 10 minutes or less. It is designed to add shine and clean up fingerprints, bird droppings, splash marks and light dust. Our Quick Shine Detailing Towel is the safest and softest way to clean your vehicle between car washes. At 460gsm, the detailing towel is one of the thickest towels on the market and is perfect for use with a detail spray, such as our Golden Shine Quick Shine Instant Detailer. Simply spray some detail spray on the paint and wipe it off with a Detailing Towel to get a brilliant and streak free shine without scratching. The 16"x16" towels are machine washable and will not lint. Come as a pack of 3 towels or a pack of 10 towels.